Raja Ampat, the Four Kings, is an extensive archipelago comprising over 1,500 small islands surrounding the four main islands – Misool, Salawati, Batanta, Waigeo and the smaller island of Kofiau. The area also contains Cenderawasih Bay, the largest national marine park in Indonesia. It is a part of West Papua in the far east of Indonesia, formerly known as Irian Jaya. Some of the islands are actually closer to Australia than Jakarta – the capital city of Indonesia is about 3,000km from Raja Ampat! Raja Ampat has been called the cradle of marine biodiversity and in the last 5 – 10 years has become a very popular place to dive. At some dive sites you have hard corals, at others it’s mostly soft corals, and with such a large number of islands you find many different ecosystems including seagrass beds, mangroves, shallow reefs, deep drop offs, black sand, plus there are more recorded species of fish in Raja Ampat than anywhere else. 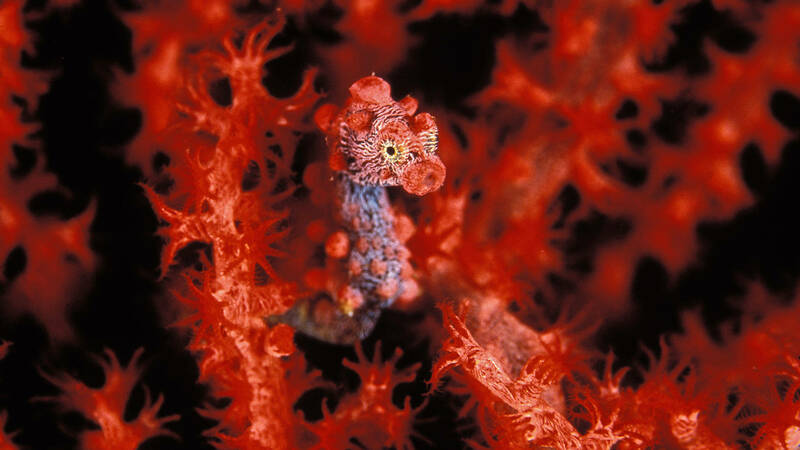 Depending on the dive site you may find whalesharks or pygmy seahorses. Liveaboards in Raja Ampat tend to be long trips of 7 – 10 days because this is a huge area to cover, plus some trips head west towards the Maluku Islands or Sulawesi, some south to the Banda sea and there are some even longer trips doing the crossing between Raja Ampat and Komodo. 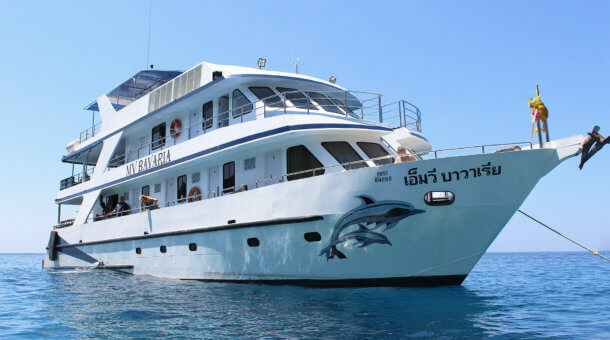 You can see it’s for serious divers only, maybe not the place to try your first liveaboard. Most trips depart from Sorong, which is easily reached by domestic flights via Manado or Makassar. Generally the best time to dive is November to April, but you can dive year round. 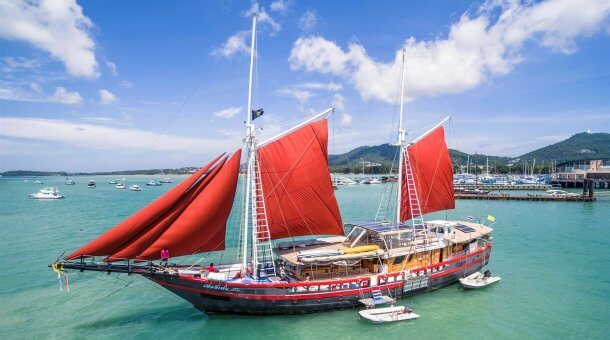 Many boats will switch to Komodo from June to October to get the best of both worlds. 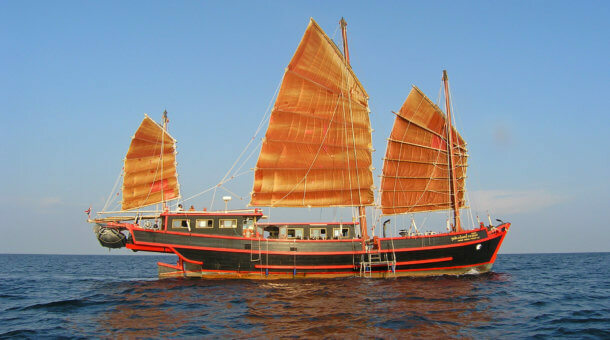 For a list of all the liveaboards we offer see here : Indonesia Liveaboards. To the southeast of Misool Island are hundreds of small islands and islets. Boo Rock (also called Boo Windows) is best known for the natural “windows” on the southern end of the largest rock from surface down to about 5 meters. Great underwater scenery, and a great place for macro photography – Living around the soft corals you can find critters including pygmy seahorses, decorator crabs, and many small commensal species living with crinoids. Another of the best of Raja Ampat. A submerged ridge connects Tank Rock to Nudi Rock, and with favorable conditions, you may even be able to dive all the way to Fiabacet’s middle island. 3 pinnacles lie to the east of Tank Rock. Giant grouper 6 – 8 feet long long may approach close to divers in deeper waters. The fish schools around these pinnacles can make it difficult to see the reef. 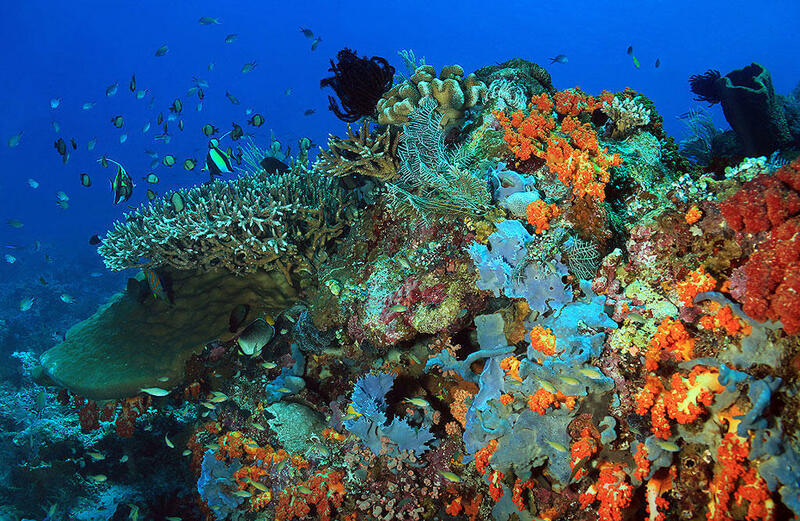 One of the most pristine coral reefs you will ever find. 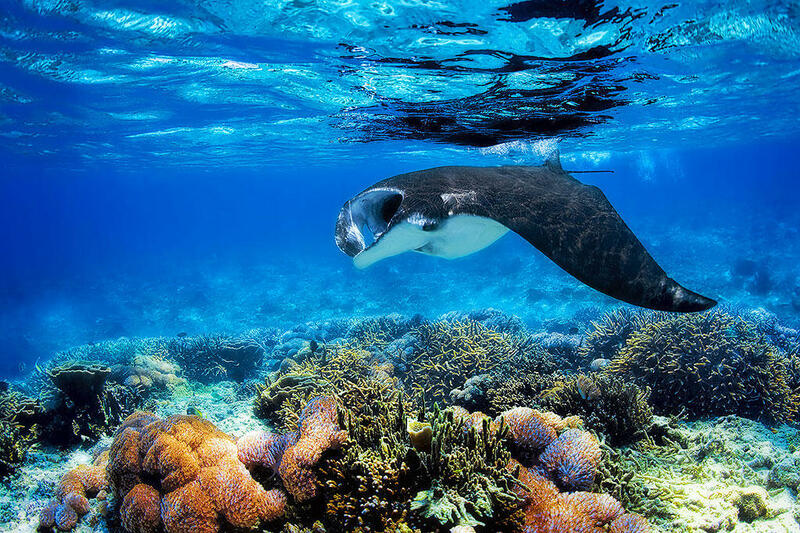 Manta Rays may be seen at cleaning stations in shallow water. You can keep your clothes on here! The dive site is named for nudibranchs or maybe because the rock even kind of looks like a nudibranch from the surface! Nudi Rock is certainly one of the best dives in Raja Ampat. The submarine landscape, with soft corals and sea fans in some areas, and hard corals in other areas is incredible. All kinds of fish here in abundance – snappers, groupers, Napoleon wrasse, barracuda and turtles too. Whale Rock has been called the most beautiful dive site in Raja Ampat. Everywhere you look are sea fans and soft coral. And a healthy variety of marine life – look for barracuda and trevally hunting schools of bait fish, schooling bannerfish, many juvenile fish and even bigger creatures like turtles and reef sharks. Need 2 cameras with 2 lenses! From the surface, from the right angle, the rock looks a bit like a whale. Magic Mountain is an offshore pinnacle in deeper water with non stop fish action. Best to dive when the current is running where schools of barracuda, fusiliers, surgeon fish and others are found swimming in the current. In the shallows, jacks and trevallies are hunting the baitfish and big Napolean wrasse are found. On the west side of the pinnacle you will often find white tip and grey reef sharks cruising in the currents welling up from the deeper waters. And also in this area is a cleaning station – manta rays arrive to be cleaned by wrasse and other hungry reef fish. Sardine Reef is located in the Dampier Strait in North Raja Ampat and the dive can be one of the most action-packed in the region. Fusiliers, surgeonfish, trevally, rainbow runners, tuna, sweetlips, and bannerfish are here in large numbers racing over sea fans, soft corals, and orange elephant ear sponges. You may even here fish thunder – the sound resulting from the rapid movement of such a large number of fish through open water. This is also a site to see sharks hunting .. There may be grey reefs, white tips, black tips, and even wobbegongs. This site is a small east to west ridge, with depth from about 8 – 30 meters, composed of hard corals and a few multicolour coral bommies on the east end. It’s a small site, but often dived more than once on liveaboards, because of the great schools of fish that congregate around the east end when the currents are running. A great place see “big stuff” like Spanish mackerel, dogtooth tuna, jacks, barracuda, eagle rays, grey reef sharks, giant napoleon wrasse, many different big schooling fish, and more. Plus giant oceanic mantas come here to be cleaned on top of the ridge. These dives in the Dampier Strait near Arborek island are great places to find congregations of mantas. Sometimes as many as 10 – 20 Manta rays circle around for cleaning. Most of the time Manta rays appear only when there is current. To dive here, best to find a good vantage point and wait. Mantas don’t like to be chased or harassed. Visibility here not the best – 5 – 15 meters most of the time. 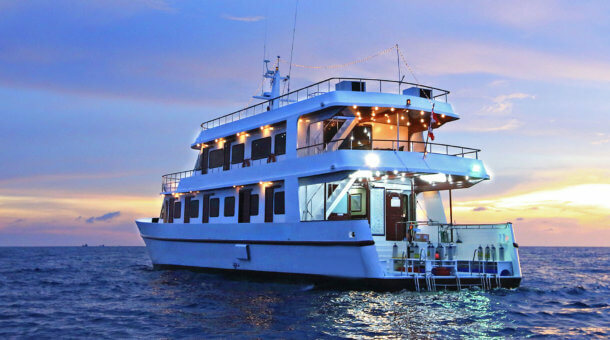 If you want to dive in Raja Ampat, a liveaboard is the way to go. Most depart from Sorong, which is accessible by air via Manado or Makassar. Liveaboards in Raja Ampat are mostly longer trips because it really is a large area of ocean to cover. Trips tend to be 7 – 10 nights. More information – see Raja Ampat Liveaboards.